A place of royal and aristocratic residences in the 17th century, the Marais was all but abandoned during the Revolution, later descending into an architectural wasteland. Since approximately 35 years, sensitive restoration has brought the area back to life again; some of Paris�s most popular museums are now housed in its elegant mansions, while the main streets and narrow passageways bustle with smart boutiques, galleries and restaurants. 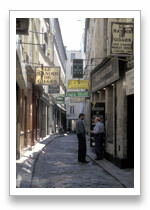 Fantastic courtyards are hidden behind the doors of the Marais. Many traders have been driven out by high prices but enough artisans, bakers and small caf�s survive. The ethnic mix of Jews, former Algerian Settlers, Asians and foreigners from all over the world is exceptional in the Marais. 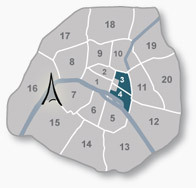 It is also the centre of the Parisian gay scene.